Well, it's been a busy couple of weeks and I've been wanting to get back to my photos but haven't had a chance until now. This was shot at Windsor Castle in May. I had a discussion just today with a friend about where photography crosses the line to art, and how each photographer starts to develop his own vision and style in post-processing. I could have posted this in a more straight-forward--and more colorful--version, but I've been enjoying playing around with actions to see the different variations of interpretations I can achieve with my images. 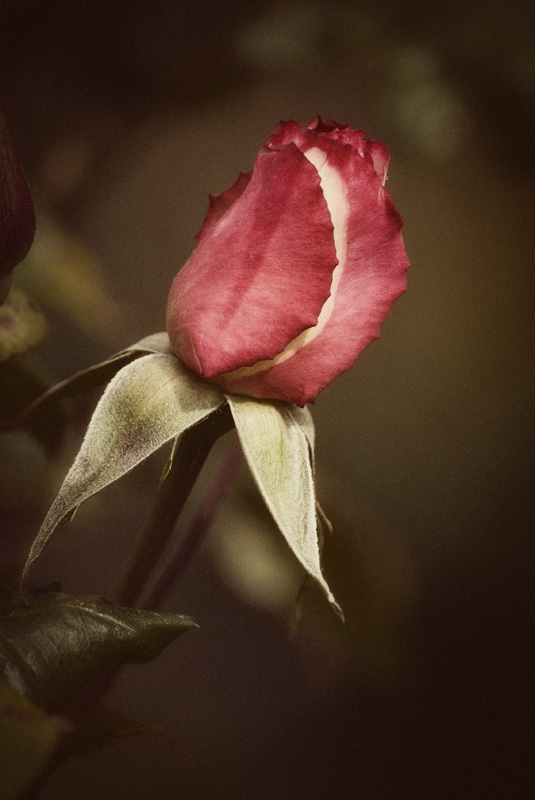 So, this rose has ended up with a more vintage, desaturated look. Maybe it works, maybe it doesn't... one thing is for certain, we each have our own tastes in what appeals to our eyes. Love the richness and depth of color. Excellent detail.